Paprika -- made by grinding capsicum peppers into a fine powder -- adds vibrant red color and a rich, pungent flavor to a variety of meals. At 19 calories per tablespoon, paprika adds only a negligible amount to your daily calorie intake, but it comes packed with nutrients. Just a single 1-tablespoon serving provides ample amounts of several beneficial nutrients, especially carotenoids -- a nutrient family that includes vitamin A.
Paprika comes loaded with carotenoids -- the pigments that give it its deep red color. Its lutein and zeaxanthin content benefits your eyesight by preventing harmful light rays from damaging your eye tissues, while its vitamin A content aids in night vision and plays a role in healthy cell development. A tablespoon of paprika contains 3,349 international units of vitamin A -- more than 100 percent of the daily intake requirement for men and women, set by the Institute of Medicine. While, as of September 2013, the Institute of Medicine has not set a recommended daily intake, consuming 12 milligrams daily improves eyesight, reports the American Optometric Association. Each serving of paprika has 1.3 milligrams of lutein and zeaxanthin, or 11 percent of this goal. Paprika also boosts your daily intake of vitamin E. Each tablespoon provides 2 milligrams of vitamin E, or 13 percent of the recommended daily intake determined by the Institute of Medicine. Vitamin E helps control blood clot formation and promotes healthy blood vessel function, and also serves as an antioxidant, preventing cellular lipids from destruction. Getting enough vitamin E in your diet also promotes healthy cell communication. Adding paprika to your diet also helps you get more iron. The iron from your diet supports your cellular metabolism -- it allows your cells to carry out a series of chemical reactions, called the electron transport chain, that result in the energy production. Iron also supports the function of hemoglobin and myoglobin -- two proteins tasked with transporting and storing oxygen that your tissues need to function. 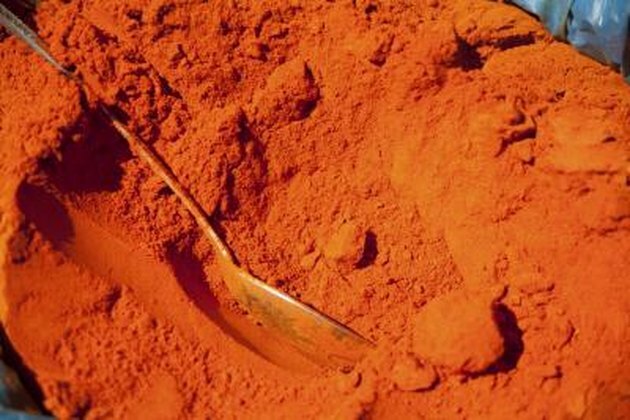 A tablespoon of paprika contains 1.4 milligrams of iron, providing 8 and 18 percent of the daily recommended intakes for women and men, respectively, determined by the Institute of Medicine. Combine paprika with other spices, such as garlic powder and cayenne, and use as a healthful rub for chicken breast, fish or lean red meat. Lightly coat sweet potatoes in olive oil and paprika, and then roast until tender, or use paprika as a seasoning for roasted or steamed carrots. Add a spoonful of paprika to your favorite hummus to add flavor, or roast peeled chickpeas in a mix of paprika and coconut oil for a healthful snack. Finally, try using paprika to season homemade soups -- it pairs especially well with pureed carrot, squash or pumpkin soups. What Are the Health Benefits of Fresh Basil Leaves? What Are the Benefits of Parsley & Cilantro?